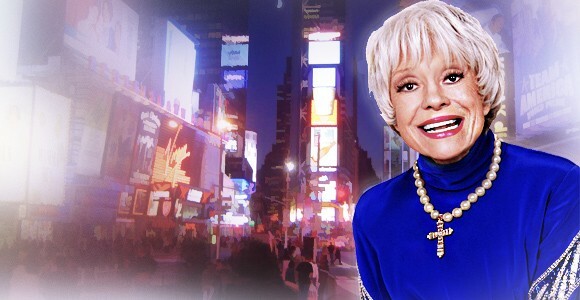 Triple Tony award winner Carol Elaine Channing is best remembered for bringing Lorelei Lee to life in Gentlemen Prefer Blondes with her signature song, “Diamonds Are a Girl’s Best Friend.” She also originated on Broadway the musical-comedy role of matchmaking widow Dolly Gallagher Levi in Hello Dolly. Other theater credits include No For an Answer, Lend an Ear, Wonderful Town, The Vamp, Four on a Garden, and Legends. Channing appeared in a number of movies, The First Traveling Sales Lady with Ginger Rogers in 1956, the cult film Skidoo, and Thoroughly Modern Millie opposite Julie Andrews and Mary Tyler Moore, for which she received an Academy Award nomination and received a Golden Globe Award for Best Supporting Actress – Motion Picture. During her career, Channing also made some guest appearances on television sitcoms and talk shows including What’s My Line (1962-1966), and did some voiceover work in cartoons, most notably as Grandmama Addams in an animated version of The Addams Family, which ran from 1992-1995. Channing has been married four times, and has a son who is now a Pulitzer-prize-nominated cartoonist publishing under the name Chan Lowe. On May 10, 2003, she married Harry Kullijian, her junior high sweetheart, after reuniting with him after about 7 decades. 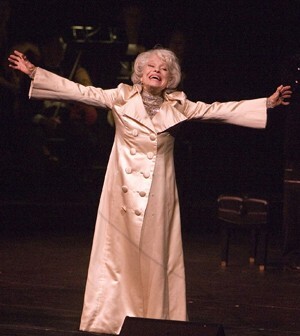 The 89-year-old Broadway legend received her honorary doctorate from California State University Stanislaus in 2004. Since then she and Kullijian have been promoting arts in education through the Dr. Carol Channing and Harry Kullijian Foundation for the Arts. Melissa Parker (Smashing Interviews Magazine): It’s such a pleasure to speak with you. Let’s talk about your campaign to save the arts in public schools. Carol Channing: Oh, thank you. Melissa Parker (Smashing Interviews Magazine): Do you actually go into the schools and speak to the students and the teachers about arts programs? Carol Channing: I’ve been doing that for several years. I’ve been going and teaching master classes about the arts and they get all excited. Some schools, like in Palo Alto, already have the arts and boy, are they smart! They ask questions about everything I learned in San Francisco. San Francisco is a metropolitan art colony. It was when I was growing up there so we got people from all over the world entertaining us, even Japan and Germany’s greatest entertainers. We had everybody because they had a guaranteed audience in San Francisco. Melissa Parker (Smashing Interviews Magazine): Do you normally get a good response from the kids when you speak about the arts? Carol Channing: Yes, it is just wonderful! Melissa Parker (Smashing Interviews Magazine): What are the advantages of having arts programs in learning institutions? Carol Channing: It made me smarter in subjects I wasn’t the least bit interested in. Children ask, “What’s a concert?” It’s not only the next generation but it’s the United States of America at stake and they don’t know what a concert is. That’s impossible. We’re going right down the drain. Melissa Parker (Smashing Interviews Magazine): The songwriter is a neighbor? Carol Channing: Yes, Harry has known him all his life. His wife (Renee) is a schoolteacher of the arts and she got fired. I don’t know how he did it, but Harry saved her job. Renee said, “I just got fired and I live to feed those children what they need to have.” But, Harry was on the City Council once and he knew what to do to get her job back. Melissa Parker (Smashing Interviews Magazine): Your friend, Congresswoman Jackie Speier, is also an arts supporter. Carol Channing: Jackie Speier is our heroine. She’s in Congress and it went through like gangbusters in the House, but it’s coming up for the Senate. Melissa parker (Smashing Interviews Magazine): Carol, did you enjoy your visit to The View a few weeks ago? Carol Channing: Oh, did you see that? Melissa Parker (Smashing Interviews Magazine): Yes, I thought you were great. Carol Channing: Thank you. I hope we got through about the arts. Oh, you heard me sing that song there. Melissa Parker (Smashing Interviews Magazine): Yes, but it was much better singing it directly to me. I recently saw you on Hannity and you said that you agree with him now. Have you changed your politics? Carol Channing: No, I’m an independent. Melissa Parker (Smashing Interviews Magazine): Let’s talk about your latest album, For Heaven’s Sake. 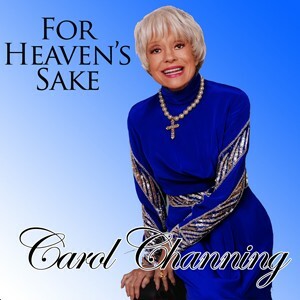 Carol Channing: Oh yes, it’s a gospel album and mostly songs my father taught me. He was born in Augusta, Georgia and lived to a ripe old age. He heard these wonderful songs, some of them were spirituals, some of them were gospel. Some of them were just old American songs and I’m singing those on the album. He taught me from the bassinet on up. I just love them so we thought we’d do an album. This same truck driver (John Wyatt) said, “Come on, let’s record the songs your father taught you.” He arranged the music and played several instruments. It’s thrilling because these songs are Americana. My father lived to be a ripe old age and I’m six months from being 90 years old. These songs are the musical history of Americana. I love them and treasure them. I can hear my father’s voice harmonizing with me every time I sing them although he’s long gone. Melissa Parker (Smashing Interviews Magazine): What was it like to grow up in San Francisco in the 20s and 30s? Carol Channing: As I say it’s a metropolitan art colony and I got to see all those people that came to the theaters. It’s just a beautiful city that attracts artists. I had a 50-cent allowance. I’d save it up, buy a ticket, and go all by myself to a Saturday matinee to see every one of those people. I saw Mary Wigman, who was the forerunner of Martha Graham in dance pantomime. That’s what I did on Broadway later. Melissa Parker (Smashing Interviews Magazine): You were very interested as a little girl in the theater. I knew it the moment I stepped in the darkened theater even with nothing playing. My mother opened that door, that same heavy door I couldn’t get open, so I must have been very little because I couldn’t open it. I played there several times since and opened it easily so I must’ve been little. I walked in and saw the darkened stage and the darkened houselights and thought, “This is where great wonderful things from God happen. I’m on hallowed ground.” I was too little to even … I think I must’ve been in kindergarten. I just kept walking on this dark stage. The first show I saw there starred Ethel Waters. I was on the second row; one seat in from the aisle, the man at the box office knew me. I saved my 50 cents and got to see a Russian revue and saw everything Lynn Fontanne and Alfred Lunt were ever in. They told me, “You must tour the provinces. Once you have a show that’s enough of a hit, tour the provinces because that is your next audience on Broadway.” That was so true. You build your own audience by touring. They considered me a daughter because they had no children. It was a great honor. They had seen me in everything I did on Broadway. If they hadn’t considered me like a daughter, they wouldn’t have wasted so much time with me. Melissa Parker (Smashing Interviews Magazine): Your first job on stage in New York was No For An Answer in 1941. Were you nervous? Carol Channing: Oh good Lord yes, before everything. I got to be close to Helen Hayes after I was in my first hit, Lend An Ear. Helen Hayes and I became friends because Anita Loos who wrote Gentlemen Prefer Blondes was close to her. Helen Hayes said, “I get sick with stage fright. Noel Coward threw up before every show, he got so sick. God made stage fright.” I know why because it stimulates your brain if you’re frightened. This could go wrong, that could go wrong, you could put it in reverse and the company wouldn’t know what their cue was. The orchestra won’t start if you don’t give them the right cue. A light could fall on somebody’s head … and it did fall on somebody’s head, but anyway, that fright stimulates your brain and makes you much smarter than you are any other time. Melissa Parker (Smashing Interviews Magazine): You become more alert. Carol Channing: Yes and somehow your brain spins from stage fright. She was right about that. God made stage fright. I’ve noticed over a lifetime those that do not have stage fright, are not that good on stage. Melissa Parker (Smashing Interviews Magazine): Do you have a favorite Broadway role? Carol Channing: No. By the time you get the show on, that’s the one you live for. Edward G. Robinson asked me that. When Gracie Allen died, I flew out to see George Burns because I was working with him before Hello Dolly. I flew out to sit with George the first Sunday that he was without Gracie because I used to be with him on tour and I was close to him. Edward G. Robinson was there and all of Hollywood was there wanting to help George at that time. Edward G. Robinson said, “Do you find there are scripts that come to you that you don’t want to do? But, if the boss says do it, you do it. By the time you get it memorized and dream about this character, do you find that’s the part you want to do more than any other at that moment?” I said, “I sure do.” You never think that’s going to be it. There is no favorite role. If it doesn’t get to be your favorite role at the time you’re doing it, don’t do it. Melissa Parker (Smashing Interviews Magazine): Your 1966 television special was directed by Desi Arnaz. During the commercials, you would visit CBS sitcoms like The Andy Griffith Show, Green Acres, and Hogan’s Heroes. Actors would do commercials live in those days. Carol Channing: Oh yes, I did the commercial for General Foods, Mrs. Foods, and all the little Foods. That’s the way the commercial went (laughs). Melissa Parker (Smashing Interviews Magazine): Were you friends with Desi Arnaz and Lucille Ball? Carol Channing: I adored Lucy. They had just gotten a divorce and he wanted to put on a TV special with just me. They used their writers for me which made me come out a dear sweet girl and that’s about as entertaining as it was. I mean, you can’t do that if you’re a comic. Lucy’s great comedy came right out of her own nature. The writers couldn’t adjust to me. They just couldn’t do it. I tried to explain it to them and they kept giving me Lucy lines. Well it didn’t work for me. I knew her well and was grateful to her but they couldn’t make it work. Melissa Parker (Smashing Interviews Magazine): I interviewed Rona Barrett, former entertainment journalist, a few weeks ago. Did you ever interview with her? Carol Channing: No, does she have a show now? Melissa Parker (Smashing Interviews Magazine): She is preparing to travel the country in a one-woman show for her foundation to help the elderly. 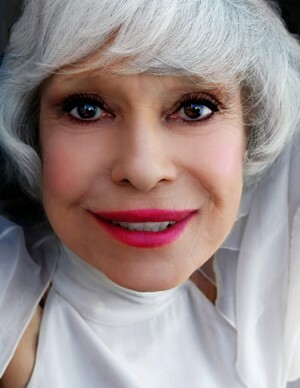 Carol Channing: She must be elderly herself now. Melissa Parker (Smashing Interviews Magazine): I believe she’ll be 74 in October. Carol Channing: That’s not elderly to me. Melissa Parker (Smashing Interviews Magazine): Rona said she always wanted to interview Jackie Kennedy. I read that Jackie came to see you backstage at Hello Dolly. Carol Channing: She sure did and they invited me up every other week to Hyannis Port in the summertime. On my Sundays off I’d leave after the Saturday night show and come back in time for the Monday night show. I got to visit with Jackie and Rose. I adored Rose. She held that family together. Jackie was lovely. Eunice was just great. I was close to all of the Kennedys. Now I’m an Independent so I just love everybody. Melissa Parker (Smashing Interviews Magazine): What was it like to work with Groucho Marx in Skidoo in 1968? Carol Channing: I never saw the movie. Otto Preminger was so difficult to work with as a producer. I didn’t have any scenes with Groucho Marx. I played Jackie Gleason’s wife. He was wonderful. Oh, I got along fine with him, but Preminger was very difficult. He felt like he was running the whole works and was the big shot. I never saw the movie but it ran for 10 years in Greenwich Village. Melissa Parker (Smashing Interviews Magazine): I heard that Groucho Marx actually took LSD before his performance in the film to prepare for the role. Did you know that? Carol Channing: No (laughs). Well, I didn’t, I’ll tell you that. I’ll bet that’s what was wrong with Otto Preminger because his wife adored him. Melissa Parker (Smashing Interviews Magazine): Will there be a film made about your life? Carol Channing: Johnny Depp said that he’s going to play me. Melissa Parker (Smashing Interviews Magazine): What do you think about that? Carol Channing: I think it’s heaven and wrote him saying, “Thank you, thank you.” He said, “I know I can do it. I care about Carol enough.” He certainly has plenty of children. He’s no gay. I think it’s an honor, I really do. Melissa Parker (Smashing Interviews Magazine): You and your husband finding each other after so many years is such a romantic story. Carol Channing: You know, the truth is, when I met him I thought he was dead and he thought I was dead because he lived in Modesto, California where they don’t know what’s going on on Broadway. They just don’t, if you’re not a television star. I did do some TV specials but he was busy on the City Council at the time. We met when I was 12 and he was 13. You know, every time he kisses me now I think I’m 12 years old again. Melissa Parker (Smashing Interviews Magazine): I think that’s very sweet. Carol Channing: It is not only sweet, it’s wonderful. It keeps me ticking and running. He’s a great art appreciator and he feels as deeply as I do about arts in public schools. Melissa Parker (Smashing Interviews Magazine): Your son, Chan Lowe, is a newspaper cartoonist. Has he joined in the fight to save the arts? Carol Channing: He’s so busy churning out cartoons every weekday. I’m just so proud of him. But his wife doesn’t like me. It is sad. I tried to get along with her. I’ve done everything. Harry is Armenian and I admire those people with all my heart. No matter what, nothing is going to separate them. They won’t allow it. His sister, Lucille, was in school with us at the time. She was 11 when I was 12 and Harry was 13. She’s now one of the wealthiest ladies in Fresno. She’s a wonderful woman and keeps the whole family … they’re wonderful that way. It’s important to do that. Melissa Parker (Smashing Interviews Magazine): I saw your appearance on The Wendy Williams Show a few weeks ago and you were talking about your grandmother being African American. Carol Channing: No, she was white, too. My mother was the one who told me that. Mother said, “You must be careful if you don’t have a black baby.” I said, “What’s wrong with that?” I couldn’t figure it out because there were no blacks in San Francisco. If I have any blacks way back I don’t know. Melissa Parker (Smashing Interviews Magazine): So there was nothing to it? Carol Channing: My mother had a disagreement with my father at the time and she was very angry at him. She wanted to do something. But, boy I admire Harry. He won’t let it happen. He’ll say, “No, you’re going to come right here and eat dinner with the rest of us. We’re going to forget what you just said and we’re going to go on being a family.” Harry is frightening when he wants to be. He lays down the law and he’s right.